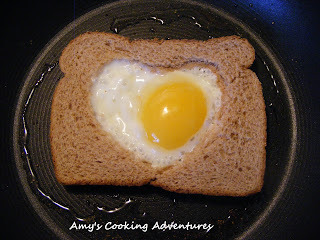 Though my mom did the majority or the cooking when I was growing up, my dad did have one specialty: Eye Egg Sandwiches, thusly named because the egg inside the toast looks like an eye peeking through the hole. This fun breakfast goes by many different names depending upon where you live, but they will always be eye egg sandwiches to me! 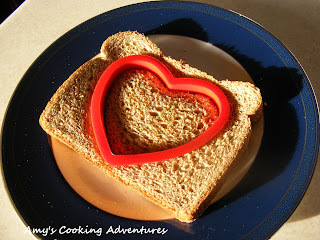 For a special valentines treat for my sweeties, I used a cookie cutter to cut a heart shape out of the toast. These look very pretty if you cook them sunny side up. They still look nice if you flip them (though you obviously won’t see the bright yellow yolk), but you have to be a good flipper…sadly, this is how my husband’s egg turned out. Good thing he loves me! Lightly toast the bread in a toaster. Meanwhile, begin heating the oil with a little salt and pepper in a skillet. 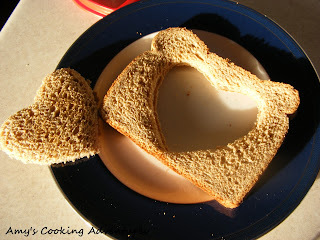 Once the bread is toasted, use a heart shape cookie cutter to cut a section out (you can use a knife or cut any other shape out if you wish). Set the cut out section aside. Lay the toast (the piece with the hole) in the skillet. Carefully crack an egg into the center and cook completely. 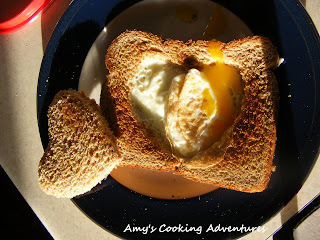 If desired, flip the egg and toast to cook over easy. I make these for my son when he comes home from college. Great idea using the heart cookie cutter.